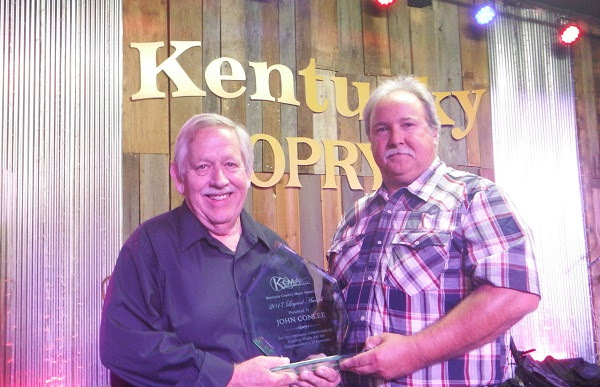 BENTON, Ky – Country legend and Kentucky native John Conlee was recently awarded the first ever Legends Award by the Kentucky Country Music Association during his performance at the Kentucky Opry. The award was created to honor an artist who is not only from Kentucky, but has also promoted Kentucky throughout their career in both music and interviews. “It is always gratifying to be recognized by those from my home state of Kentucky. My profound thanks to the Kentucky Country Music Association and Kentucky Governor Matt Bevin for their very kind honors,” said Conlee. For more information visit johnconlee.com. Sept. 14 – White County Fair – Searcy, Ariz.
Sept. 15 – The Stage at Silver Star Steakhouse – Bossier City, La. Sept. 21 – Grundy High School Auditorium – Grundy, Va.
Sept. 22 – Clayton Center – Clayton, N.C.
Sept. 23 – Ground Zero – Myrtle Beach, S.C.
Oct. 05 – The Historic State Theatre – Elizabethtown, Ky.
Oct. 06 – Mitchell Opera House – Mitchell, Ind. Oct. 07 – Sesser Opera House – Sesser, Ill.
Oct. 08 – Historic Rodgers Theatre – Poplar Bluff, Mo. Oct. 19 – Sunset Theatre – Asheboro, N.C.
Oct. 20 – Carteret Theatre – Morehead City, N.C.
Oct. 22 – Harvest Performance Center – Rocky Mount, Va.
Nov. 17 – Route 92 – Youngsville, La. Feb. 22 – Wadsworth Auditorium – Newnan, Ga.
Feb. 23 – Tallassee High School Auditorium – Tallassee, Ala.
Feb. 24 – Theatre Dublin – Dublin, Ga.
Feb. 25 – Mars Theatre – Springfield, Ga.
March 03 – Cecilian Auditorium in the Conservatory of Music – West Terre Haute, Ind. March 04 – Jasper Arts Center – Jasper, Ind. April 07 – Orange Blossom Opry – Weirsdale, Fla.
Aug. 02 – Social Circle Theatre – Social Circle, Ga.
Sept. 07 – Newberry Opera – Newberry, S.C.
Searcy Arkansas rather than Arizona. I got excited for a second lol.